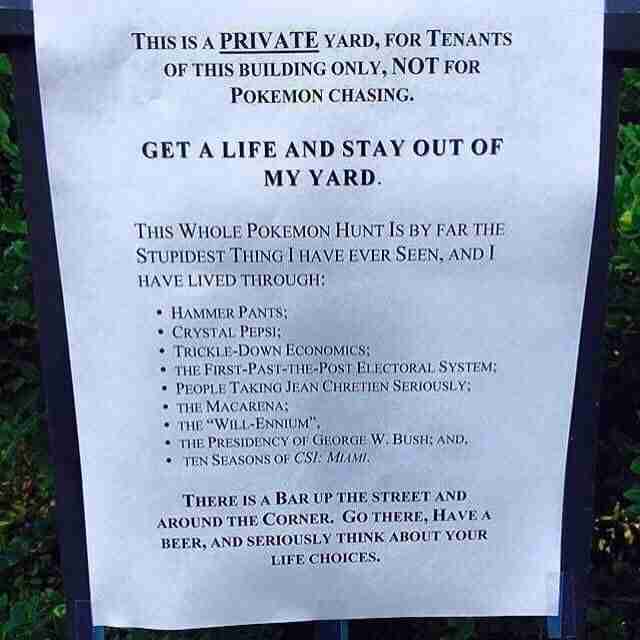 While Pokémania sweeps the world, some joyless curmudgeons are having a tough time with people having fun in a way that's different from what they did as a kid. While for many that means afternoons spent shaking a balled fist at the sky, for one person it meant posting an angry sign that literally told those rascally kids to stay off the lawn. Pokémon Go is getting a lot of people out of the house, but the GPS-based game could be pretty annoying if you're getting a constant stream of users coming to your home because it has unknowingly become a Pokestop or gym. That kind of designation could mean anything from just a couple people passing by to a wild mob scene like there was at New York's Central Park over the weekend. 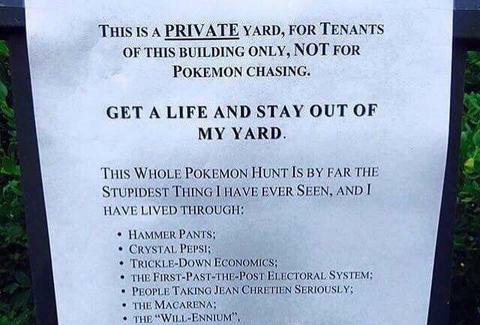 The angry note not only tells Pokémon Go players to stay away but admonishes their life choices, likening the game to other embarrassing fads like Hammer pants and "The Macarena" (for the preservation of your childhood, don't look up the translated lyrics to that song). The note-writer will be very disappointed to discover that one of those embarrassing fads is back. This is not their summer. Dustin Nelson is a News Writer with Thrillist. He made the mistake of looking up a translation of the lyrics for "'The Macarena." Follow him @dlukenelson.